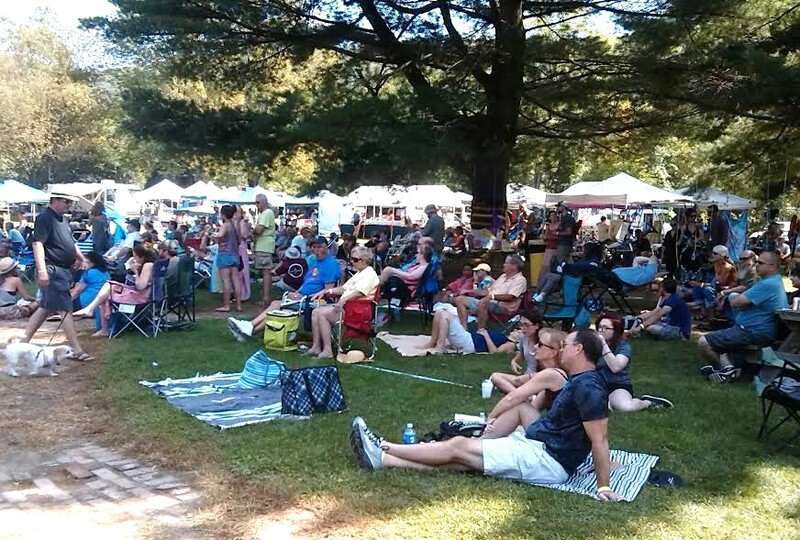 While much of Sunday’s Cornstock crowd (above) chose to sit in the shade, die hard fans of The Coal Town Rounders (top with Jessica Illuzzi) effectively surrounded the stage and danced in a warm late summer sun. 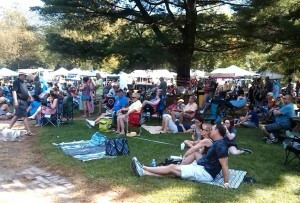 The Cornstock Folk Festival, held from Sept. 4 to 6 in Tunkhannock Township continued to demonstrate the potential of Lazy Brook Park as a venue for events of any size to succeed in both engaging visitors in themed activities and mesmerizing them with the natural beauty of the former neighborhood and housing development. More than a thousand music fans, including many children, made the park their home this past weekend and became a community by the end of the festival. 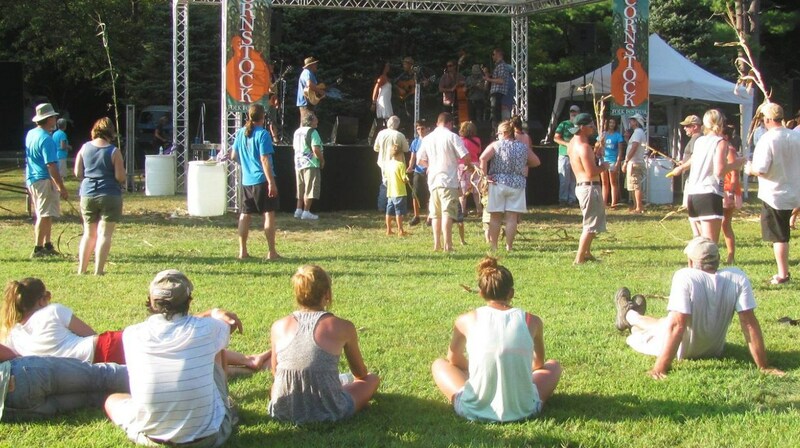 Those selling food and other items at Cornstock often make references to their “vendor family,” and that sense of camaraderie is shared by the musicians and extends to everyone else in the course of a few days “living” in the park. Add to that the unusually hot weather this year that sent so many people wading and floating in Tunkhannock Creek while leaves loosened by warm winds tumbled from dry trees, and the weekend was simply magical. This year’s patrons seemed especially laid back and friendly. Each day’s performances on the Main Stage were top notch, and there was a wide variety of food and merchandise to peruse and purchase. My partner Mike bought a tie-dye cap from our friend Katy, and we fell in love with the food from Tica’s Tacos because it was made from such wholesome ingredients. We even encouraged Mario and Jessica into some experimentation on the final day when they started to run out of some ingredients. We ask them to mix some mango and pineapple with our favorite meats, and the result was incredible. Each night, there is about and hour break after the last headliner on the Main Stage as weekenders check back into their campsites to relax before the late night parties on the back stage in the creekside pavilion. Resting is actually a good idea, because the dancing frenzy that eventually ensues as so many creative musicians criss cross and collaborate on the stage will wear you out once again and leave you ready for a peaceful sleep. Those who have the energy to stay up for smaller picking parties that go on till dawn are often seen napping in the shade during the day. Festival coordinators Jillian and Anthony Hannigan were excited about promoting additional activities for children this year. I’m sure that they were happy to see how many families took them up on it and how many children participated in daytime programs, took advantage of the bounce castle, or simply road their little bikes around the grounds for three days. I often say that I measure success at such events by the number of smiles, and there were too many to count this weekend between happy tykes and adults of all ages content to sit for hours to listen to world-class music. While a number of our local friends primarily bought day passes and opted not to camp for the weekend, we’ve discovered that it’s the best way to enjoy the festival. Mike and I both left the park for work once each and made a quick stop at the house on Saturday morning for a few more provisions. It was too late for me to return to the park on Saturday night, so I slept at home while Mike enjoyed the late show and slept in the tent. The reasonably-priced weekend ticket is genuinely worth the investment. We’ve found that having that base camp when you might not be able to stay for the entire event is both convenient and safe. Most importantly, it exposes you to the community aspects of the festival that are only hinted at during each day’s shows. Finally, I want to compliment Jillian and Anthony for spreading out featured acts from Friday through the very end of the festival on Sunday afternoon. I’ll admit that I have left such events by morning or midday on Sunday if that afternoon’s roster is filled with repeat acts. Instead, Sunday afternoon’s crowd might have been the largest all weekend with local favorites George Wesley and The Coaltown Rounders providing the last two sets with one-time performances before and all-star jubilee brought the festival to a close. Finding these kinds of events so close to Mike and I is a blessing. As dedicated homesteaders – people who make every attempt to live off their own land – it can be difficult for us to get away for two or three days, especially in the summer. 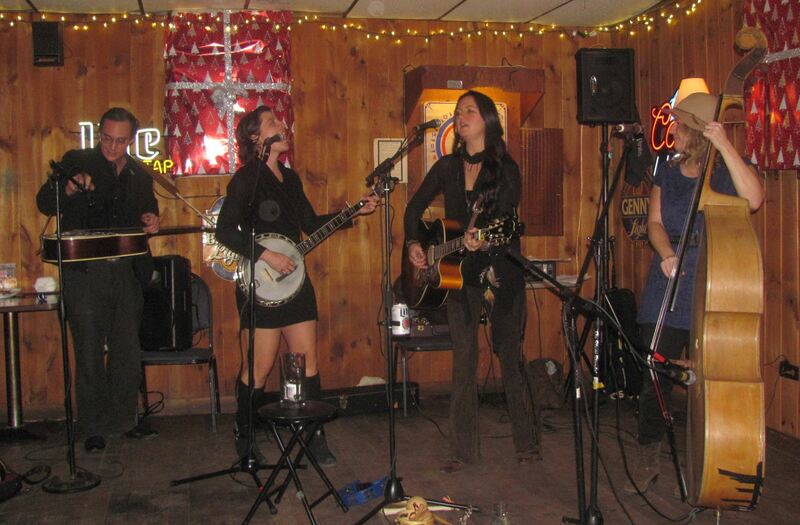 The Cornstock Folk Festival and NEPA Bluegrass in early June provide an opportunity for other local residents in our shoes to drive less than 20 minutes away and escape to well-hidden paradise. Keep that in mind for next year. Look for an additional photo gallery of Cornstock photos by me and other photographers soon.